The Mowbray Lite Toilet Aid raises the height of the toilet and provides additional support to make getting on and off the toilet easier. 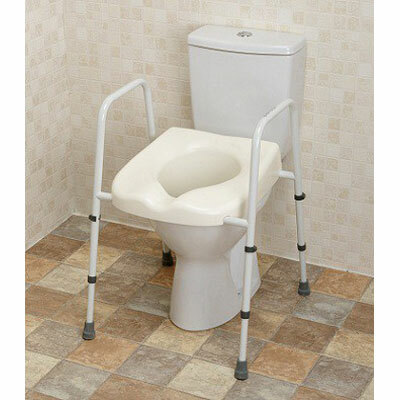 The Mowbray Lite Toilet Aid raises the height of the toilet and provides additional support to make getting on and off the toilet easier. The seat is higher at the back making it particularly suitable for a person who needs extra support to sit and rise. It also features a shorter chute to suit more modern toilets. It has an ergonomically designed, one piece moulded, contoured seat. The gently sloping seat gives thigh support and makes it extremely comfortable and front cutaway is ideal for personal cleaning. It features a Durable, Epoxy Coated Steel Frame and Unique, Numbered Inner Legs for Easy Height Adjustment that have non-slip ferrule feet.It is also Stackable and can be autoclaved up to 70°C.